What is the total number of valance electrons in a calcium atom in the ground state? Valance electrons are found in the outer most shell of an atom of or ion. Refer to the Periodic Table of Elements. The ground state electron configuration of calcium (Ca, atomic number 20) is 2-8-8-2. There are 2 electrons in the outer most shell of this atom in the ground state. Which subatomic particles are located in the nucleus of an He-4 atom? The nuclei of all atoms (with the exception of H-1_ contains protons and neutrons. (H-1 contains no neutrons only one proton). The physicist J.J. Thomson used cathode rays to identify the properties of the negative particles known as electrons. The average atomic mass of an element is calculated by determining the weighted average of all the element’s naturally occurring isotopes. The most abundant, naturally occurring isotopes have the greatest effect on the value of the average atomic mass. An atom of which element has the largest atomic radius? Use reference table S. Of the choices given, (2), Mg (atomic number 12) has the largest atomic radius. Which element requires the least amount of energy to remove the most loosely held electron from a gaseous atom in the ground state? The energy need to remove the most loosely held electron from a gaseous atom in the ground state is known as the first ionization energy. Use reference table S. Of the choices given, sodium, (atomic number 12) has the largest atomic radius. A balanced chemical equation must contain the chemical formulas of those substances that participate in the reaction, as well as the numerical coefficients to demonstrate the conservation of mass and charge. A compound is defined as as substance in which the elements present are chemically combined in a fixed proportion. This definition allows a chemical formula to be written for each compound. Use the percent composition formula given in reference table T.
Which Group 15 element exists as diatomic molecules at STP? What is the total number of electrons shared in a double covalent bond? In a double covalent bond, two pairs or 4 electrons are shared between two atoms. Which statement describes the energy change and bonds in this reaction? Energy is released as bonds are broken. Energy is released as bonds are formed. Energy is absorbed as bonds are broken. Energy is absorbed as bonds are formed. Note that the energy term appears as a reactant. This indicates that energy is absorbed by each Br2 molecule. Note also that the product consists of 2 Br atoms. This indicates that the single bond in each Br2 molecule has been broken. Which substance is can not be broken down by a chemical change? Tungsen (atomic number 74) is an element, which cannot be broken down by a chemical change. Object A at 40ºC and object B at 80ºC are placed in contact with each other. Which statement describes the heat flow between the objects? Heat flows in both directions between the objects. No heat flow occurs between the objects. Heat flows between two objects depends on their temperatures. Heat flows from the object with the higher temperature to the object with the lower temperature. Since the temperature of object B is higher than the temperature of object A, heat will flow from B to A. Which unit can be used to express the concentration of a solution? The concentration of a solution can be measured as a percentage (%), as molarity (M), and as parts per million (ppm). Which formula represents a mixture? A solution is a homogeneous mixture. The designation LiCl(aq) represents an aqueous solution of LiCl. Which sample has particles with the lowest average kinetic energy? The average kinetic energy of the particles of a sample depends solely on the temperature of the sample. The lower the temperature, the lower the average kinetic energy of the particles. Of the choices given, 9.0 g of I2 at 20ºC, has the lowest temperature and, therefore, the lowest average kinetic energy. Which gas sample at STP has the same total number of molecules as 2.0 liters of CO2 (g) at STP? Acogadro’s hypothesis states that equal volumes of gases at the same temperature and pressure contain equal numbers of molecules. All of the gases in this question are at STP. In other words, they are all at the same temperature and pressure. Of the choices given only 2.0L of Cl2 (g) occupies the same volume as 2.0L of CO2. Distillation is used to separate mixtures that contain substances with different boiling points. Hydrocarbons are compounds, not elements. Which compound is insoluble in water? A gas sample is at 25ºC and 1.0 atmosphere. Which changes in temperature and pressure will cause this sample to behave more like an ideal gas? Read gases behave more like an ideal gas when their molecules are far enough apart to make their molecular volumes negligible (low pressure) and are moving fast enough to over come any intermolecular forces (high temperature). Can’t remember all that – Use RPO ABC Rule. The question above asks for Ideal – just reverse all the arrows! The isotopes K-37 and K-42 are isotopes of the same element, potassium. Each element has a unique bright-line spectrum. Therefore, K-37 and K-42 will have the same bright-line spectrum. Organic chemistry is the study of carbon compounds. 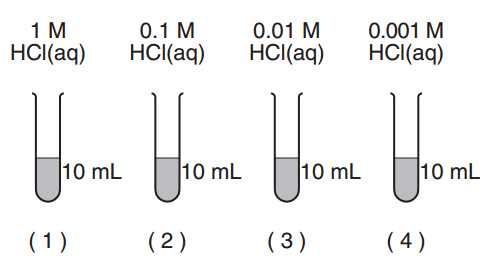 Each of four test tubes contains a different concentration of HCl(aq) at 25ºC. A 1-gram cube of Zn is added to each test tube. In which test tube is the reaction occurring at the fastest rate? The speed of the reaction between Zn(s) and HCl(aq) depends on several factors, including the concentration of the HCl solution. 1M HCl(aq), has the highest concentation of HCl and will yield the fastest rate. Which energy conversion occurs during the operation of an electrolytic cell? An electrolytic cell is a type of electrochemical cell in which an external source of electrical energy is converted to the chemical energy needed to dive a reduction-oxidation reaction that is not spontaneous. Which compound is an Arrhenius acid? An Arrhenius acid is one that releases H+ ion in aqueous solution. Use Reference Table K. HCl is one of the more common Arrhenius acids. Based on the results of testing colorless solutions with indicators, which solution is most acidic? A solution is acidic if its pH is less than 7.0. As the pH decreases, the acidity of the solution increases. Use Reference Table M. Methyl orange is red at a pH of 3.2 or less. In which type of reaction is an atom of one element converted to an atom of a different element? Transmutation is defined as the nuclear process in which the nucleus of one element is transformed into the nucleus of another element. Which nuclide is listed with its half-life and decay mode? In order to determine the molecular formula, count the total number of carbon and hydrogen atoms. The molecular formula is C5H10. In order to determine the empirical formula, reduce the molecular formula to smallest whole numbers by dividing by 5. The empirical formula is CH2. The table below show the number of subatomic particles in atom X and in atom Z. An element is defined by the number of protons contained in each atom of the element, which is its atomic number. Refer to the Periodic table of elements. The element carbon (C) has an atomic number of 6. An atom of O-17 contains 8 protons, 9 neutrons, and 8 electrons. The masses of these subatomic particles in decreasing order are neutrons> protons> electrons. Since the most massive particles (the neutron) is present in the greatest quantity (9), it follows that neutrons contribute most to the mass composition of O-17. The bond between which two atoms is most polar? The polarity of bonds between atoms can be estimated by determining the difference in electronegativities of the two atoms. Use reference table S. The difference between I and F is the greatest therefore it is the most polar. Use Reference Table E. The sulfate ion has a charge of 2- (SO4-2). Since 3 sulfate ions are present in the compound, the total charge from sulfate must be 6-. the 2 ions of element X must therefore have a total charge of 6+. So , each ion of X must carry a charge of 3+ (X3+). Refer to the periodic table of elements. Of the choices given, only Group 13 contains metallic elements whose ions carry a charge of 3+. At STP, which element is solid, brittle, and a poor conductor of electricity? A solid element that is brittle and a poor conductor of electricity is most likely a non-metal. Refer to the Periodic Table only S (sulfur) is a non-metallic element. A 1170. – gram sample of NaCl (l) completely reacts, producting 460. grams of Na (l). What is the total mass of Cl2 (g) produced? This is simply a problem about conservation of mass. The total mass of the reactant (1170 grams) must equal the total masses of the products. Since Na accounts for 460. grams the mass of the Cl2 must be the difference between 1170. grams and 460. grams or 710. grams. Which element forms an ionic compound when it reacts with lithium? Lithium (Li, atomic number 3) is a Group 1 element that forms a positive ion. In order to form an ionic compound, it must combine with a negative ion. Use the Periodic Table of Elements. Only Br, forms a negative ion. the formula represents the compound ethyne, a linear molecule. Since the molecule is symmetrical, the polarities of its individual bonds cancel each other. So the molecule is non-polar. Which compound has both ionic and covalent bonds? See reference table E. Generally, compounds that contain polyatomic ions have both ionic and covalent bonding. The covalent bonding exists within the polyatomic ion. A cylinder with a movable piston contains a sample of gas having a volume of 6.0 liters at 293 K and 1.0 atmosphere. What is the volume of the sample after the gas is heated to 303 K, while the pressure is held at 1.0 atmosphere? What is the minimum amount of heat required to completely melt 20.0 grams of ice at its melting point? Increasing the temperature of a chemical reaction increases the average kinetic energy of the reacting particles, resulting in an increase in the number of particle collisions per unit of time. As the number of particle collisions increases, the number of effective collisions also increases. Entropy is the measure of randomness or disorder in a system. As the CO2 changes from solid to gas, the molecules can assume more random arrangements. The entropy of the system increases. Which two factors must be equal when a chemical reaction reaches equilibrium? 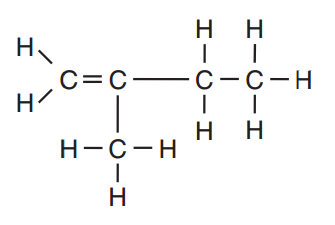 Simple unsaturated hydrocarbons contain double or triple bonds. Their general formulas are CnH2n and CnH2n-2 respectively. See Reference Table R. Esterification is the reaction between an acid and an alcohol. During the reaction a molecule of water is removed from the reactants and an organic compound known as an ester is produced. Which balanced equation represents a redox reaction? In a redox reaction, electrons are transferred between reacting particles and the oxidation numbers of the particles change. The easiest way to identify redox reactions is to identify a free element in an equation. For each change in 1 pH unit, the hydronium ion concentration of a solution changes tenfold. the hydronium ion concentration of a solution with a pH of 3.0 is ten times less than the hydronium ion concentration of a solution with a pH of 2.0. Which isotope is used to treat cancer? Radioactive isotopes have many uses in science, medicine, and industry. The isotope Co-60 is widely used to treat cancer by radiation. U-238 is used to determine the age of rocks and also to ‘breed’ nuclear fuel.